My blue scrap bin has been overflowing, even after I pulled out an assortment of light and dark blues for the pinwheel quilt I posted last time. 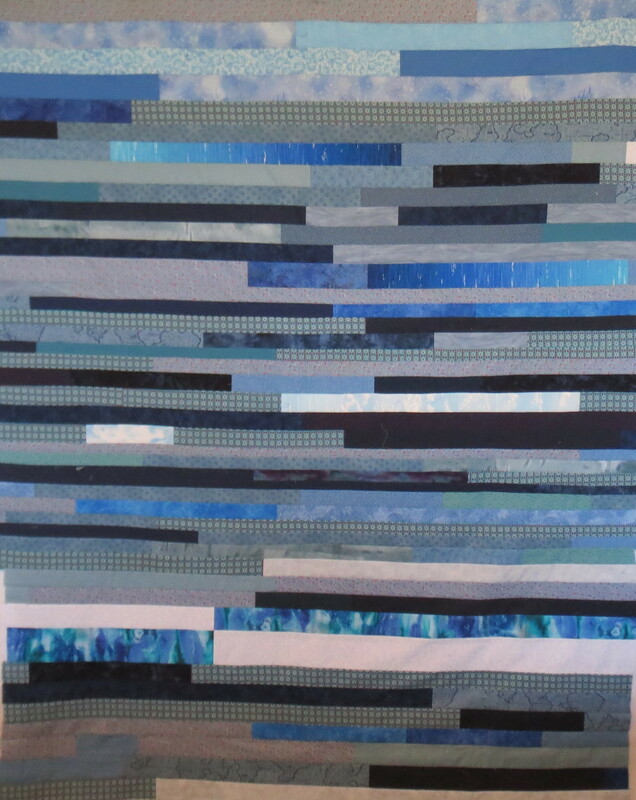 Many of my scraps are long strips, so I decided to make a blue quilt using these strips. I also cut more strips, ranging in width from 1 1/2 inches to 2 1/2 inches wide. All these strips came out of the blue scrap bin, often from wider strips. The length of the strips varied from 5 inches to 40 inches. I cut out a bunch of 6 1/2 inch squares from newsprint to use as foundations for the blocks. The blocks I made used light fabrics on one side and medium/dark on the other side, as shown in the photo below. I found I had to mark a straight line on the wrong side of the fabric to ensure the seam was straight. In spite of the spiffy laser line on my new Brother machine (more about that in another post), I couldn’t get a really straight line without marking. 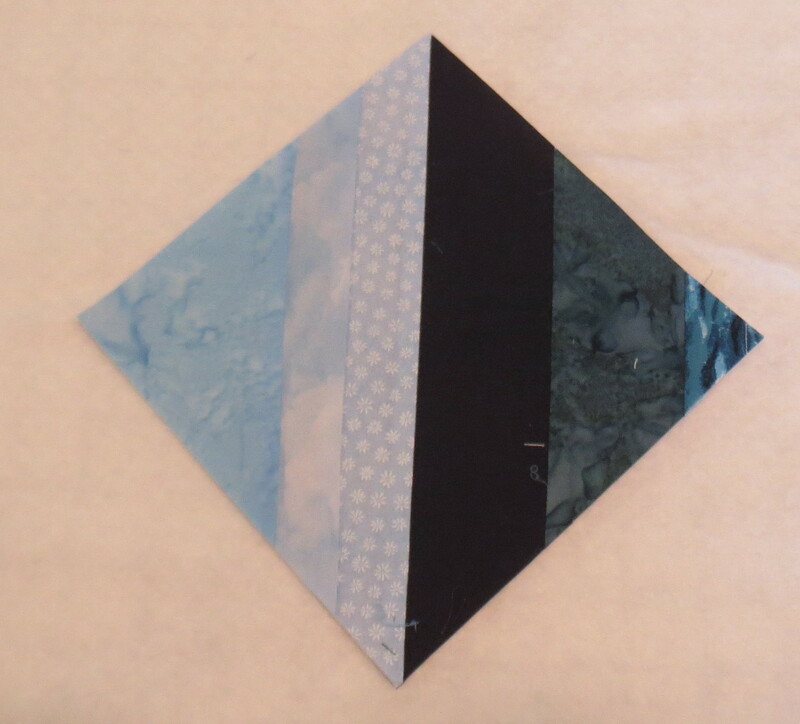 After I had 80 blocks made like this, I arranged them into diamond shapes and sewed together the blocks to make the quilt top below. There were lots of strips left over so I used them to make the quilt back as shown here. I had been careful to stay with a limited blue palette in the blocks so the colors would blend, but I used some stronger blue colors in the back. And here is what is remaining in my blue scrap bin. It doesn’t even look like I made a dent in it! Actually I did, because before I started it was hard to get the top closed. I used up most of the lights but still have plenty of medium and dark blues left. I think it is time to either get serious about managing my scraps or give them away! 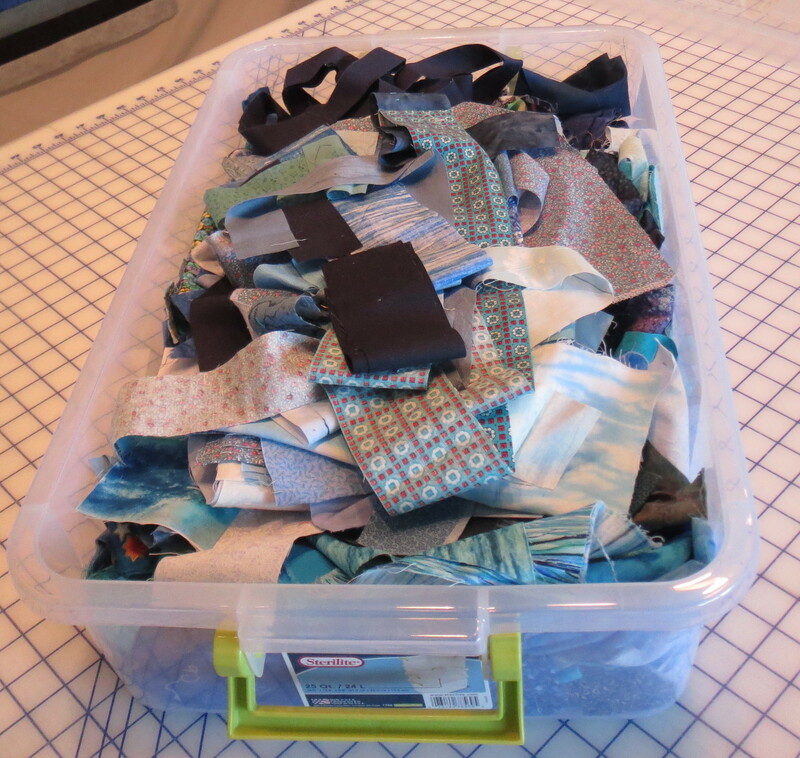 More about scrap management in another post coming up — several quilters have developed systems for organizing scraps, and I’m going to investigate them to see if I like one. 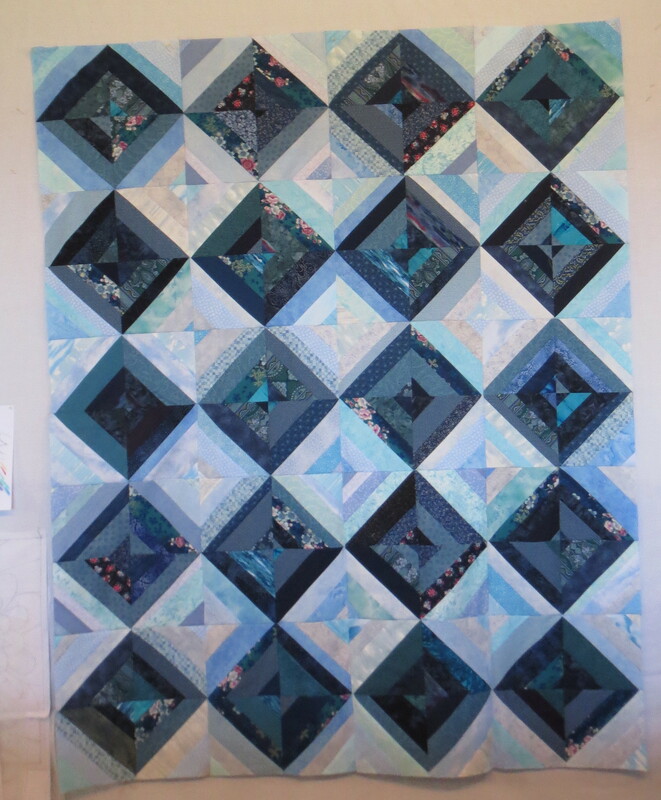 This entry was posted in Contemporary Quilts, Lap quilts, Quilting, Scrap quilts, Simple quilts and tagged scrappy quilts, strip piecing on September 15, 2014 by Shirley at Mystery Bay Quilt Design. Thanks, Doris. I know you have been working your scraps for years and are doing far better than I am at using them up!